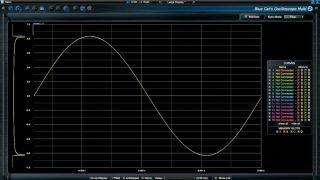 "In an oscilloscope, the horizontal axis represents time - this sine wave gets through one cycle in about 3.5ms." An oscilloscope uses a two-axis graph to give a visual representation of a waveform over time, with the horizontal axis representing time and the vertical axis representing the amplitude. In music production, oscilloscopes are commonly used to assist dynamics processing and sound synthesis. In both contexts, an oscilloscope is usually placed last in the signal chain, so that it analyses the cumulative effects of any plugins placed before it. Like any analysis plugin, though, you can place it anywhere in the chain, to view the signal at that point. If you drop a drum loop onto a DAW's audio track, it will appear as a static waveform clip/ region, representing the original audio 'on the way in'. An oscilloscope placed over the track at the end of the signal chain will show in real- time how that waveform has been affected by any processing, and how it looks 'on the way out'. When applying compression to a drum loop, for example, an oscilloscope will help you observe how the transient portion (the initial spike) of each drum hit is affected by the attack time (a fast attack time will squash the transient, so its height on the display will decrease); or how a low threshold combined with a high compression ratio and quick release time will cause the tail's relative level to increase, giving body to the hit (its height on the display will increase). As an aid to sound design, an oscilloscope acts as a sonic microscope, capable of observing single cycles of a waveform. It's possible to directly observe how slowly low-pass filtering a harmonic-rich wave (eg, sawtooth) gradually rounds off its sharp edges, removing harmonics until it becomes a smooth sine wave; or to actually watch pulse width modulation when it's applied to a square wave. When it comes to understanding synthesis concepts, an oscilloscope can be invaluable. There are a few things you need to know when using an oscilloscope. The horizontal axis may give measurements in samples, a division of time, and sometimes musical values like note lengths; the vertical axis will almost always be in dB. The scales of both axes can be changed to zoom in/out on the waveform. You'll generally set the level (vertical axis) to maximise the display, but the time setting is more interesting, as you can 'zoom in' to measure a single wave cycle up close, or 'zoom out' so that you can see the waveform over a much longer period. "An oscilloscope acts as a sonic microscope." The measurement of a single wave cycle at a particular frequency will always be the same if you measure it in milliseconds, but measuring it in samples means the measurement depends on the sample rate your DAW is set to. A single cycle of a 100Hz wave sampled at 44,100kHz will be represented by 441 samples,whereas, if it's sampled at 96kHz, that same cycle will be represented by 960 samples. Bear this in mind when configuring the horizontal axis units. In 'free running' mode, the oscilloscope will plot the waveform from left to right until it hits the right-hand edge of the display, at which point it will reset/retrigger, beginning the drawing process again from the left-hand side, overwriting the existing waveform trace. But the time it takes the oscilloscope to fill its display may not be in sync with the waveform's frequency (or the music's tempo), causing the image to jump around erratically. To this end, oscilloscopes offer a configurable reset/retrigger function, the classic mode being 'rising edge', where every time the level passes from negative to positive (ie, it rises past the centre point of the horizontal axis), the oscilloscope starts drawing from the left-hand edge again. This allows basic waveforms to be observed steadily. Some 'scopes also let you set the reset time in beats and bars - great for observing musical material like drum loops! For a complete guide to visual mixing check out the June issue of Computer Music magazine (CM204).